Stephenville City Hall is located at 298 West Washington Street, Stephenville, TX 76401; phone: 254-918-1225. Photo: J. D. Berry House, ca. 1869, 525 East Washington Street, Stephenville, TX. Listed on the National Register of Historic Places in 1980. Photographed by user:Renelibrary (own work), 2012, [cc-by-3.0 (creativecommons.org/licenses/by/3.0)], via Wikimedia Commons, accessed June, 2015. 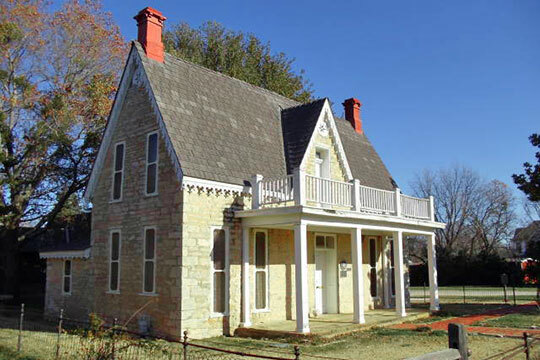 Stephenville is named for John M. Stephen, who settled the area in 1854 and donated the land for the town site laid out by George B. Erath when the County was organized in 1856. Stephen donated an additional fifty acres of timber to promote the development of the community and became the first postmaster in 1857. By 1858, when the population had grown to 766, Comanche raids were common. The turmoil caused by these Indian raids and by the Civil War and its aftermath reduced the population to 300 by 1871. Thereafter, the town grew steadily as a center for agricultural and livestock production. After 1886 the area was also a center for coal mining, an important industry there for the next thirty years. The Texas Pacific, the County's first newspaper, began in Stephenville in 1870. The town was permanently incorporated in 1889, the year the Fort Worth and Rio Grande Railway arrived. Most of the stone buildings on the town square date from the 1890s, the decade in which John Tarleton Agricultural College (now Tarleton State University) opened. Another newspaper, the Tribune, also began at that time; it later merged with the town's original paper, which had become the Empire, to form the Empire-Tribune. Stephenville and Erath County had an oil boom from 1918 to 1920, but the important fields lay outside the County, and the expectations of great fortunes in petroleum soon faded. The town grew slowly in the next decades, from a population of 3,891 in 1920 to 4,768 in 1940. In 1953, an industrial foundation was formed and within ten years Stephenville had industries including a creamery, hatcheries, feed mills, meatpacking plants, a garment factory, and nurseries. City of Stephenville, Texas, 2030 Comprehensive Plan, 2005, www.ci.stephenville.tx.us, accessed June, 2015.